The holidays are finally here. Phoenix is a crisp 80 degrees, the palm trees are illuminated by white lights, and the shopping malls are as crowded as ever. Although the Valley of the Sun may lack some time-honored holiday joys -- like snow and reindeer -- we make up for it with plenty of lights and holiday spirit. To make the most of your holiday season, check out our list of must-attend events and Phoenix holiday bucket list items. Lights of the World is the largest festival of its kind on the continent, and this year it has a new home in downtown Phoenix. Not only does it offer more lights than every house in your neighborhood combined, it incorporates traditions from cultures from across the world, as well as global cuisine. Activities include carnival rides, games, acrobatics, dance, and music performances. 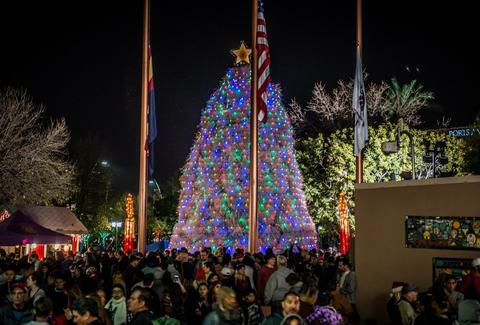 Zoolights is an undeniable can’t-miss Phoenix holiday event. It combines literally millions of lights (in the shape of animals), actual animals (kind of, it is dark) and some really great hot chocolate, so you can see why it’s a hit. There’s even an artificial snowfall -- definitely something to take advantage of here in Phoenix. This luxurious bar -- located on the top of the Hotel Palomar -- is hosting a free pre-Turkey Day party Wednesday night that whiskey lovers definitely shouldn't miss. The affair is sponsored by Wild Turkey Bourbon, which is fitting given the timing, and the DJ starts at 8pm. Believe it or not, turkeys can actually run pretty fast -- 25 miles per hour to be exact -- so take a page out their book and fight holiday pounds at the Turkey Trot. Depending on how ambitious you’re feeling, you can run a 5K or a 10K, and there are even runs specifically for the kids. Plus, dressing up like a turkey is actually encouraged. Nothing evokes festive feelings quite like ice skating around a giant Christmas tree. CitySkate provides all that and more (like photos with Santa) right in the heart of downtown Phoenix. Plus, how many places can you go ice skating in a T-shirt? The Desert Botanical Garden is one of the most beautiful spaces in the Southwest, and their signature holiday event -- Las Noches de las Luminarias -- offers live music and an enchanting tour of the expansive desert garden amid the light of 8,000 hand-lit luminaria bags and thousands of twinkling lights. The Coach House is the pinnacle of holiday drinking -- it’s a bit (OK, a lot) dive-y, unpretentious, family-owned, and most importantly, completely covered with holiday lights inside and out. It’s essentially the perfect holiday drinking tradition you’ll never want to give up. The APS Electric Light Parade has been a fixture in the Valley’s holiday activity scene for over 30 years, bringing over 100,000 attendees each year and some incredibly ornate floats by Valley favorites like The Phoenix Suns and Arizona Cardinals. The parade starts at North Phoenix Baptist Church. If you’re not from Arizona this might be hard to believe, but here in the wild west we actually gather a bunch of tumbleweeds together, assemble them in the form of a Christmas tree, and light it up to commemorate the holiday season. Kind of endearing, right? And yes, surprisingly we’re the only city in the Southwest to do anything like this. The weather may be warm, but that won't stop anyone who's truly committed from heading out wearing holiday cheer on their sleeves. Head out to the city of Tempe for exclusive food and drink specials, holiday tunes, and hundreds of other folks just like you sporting their best worst sweaters. Cheese may be a great equalizer for most dinner guests, but a great cheese platter is something else entirely. This beginner class will show novices how to make and plate simple, easy-to-make cheeses -- a perfect option for impressing holiday guests, or, you know, stuffing your face whenever you want. Phoestivus is an event inspired by German Christmas markets and Seinfeld’s Festivus -- which is reason enough for you to go, but you can also look forward to over 130 local vendors with hand-crafted gifts -- meaning you won’t even have to step food in a mall to get your holiday shopping done. It’s a win-win. The Phoenix Theatre is bringing us the holiday music extravaganza we’ve all been waiting for -- the Holiday Cabaret -- full of humor, nostalgia and amusement. Vocalists Brian Sweis, Adam Vargas and Lisa Fogel, along with pianist Jay Melberg and drummer Daniel Ybarra, bring the good feelz with pop and jazz renditions of traditional holiday favorites and humorous modern medleys. Say good riddance to the last 365 with this high-end event featuring live music, a spectacular private gathering in the Royal Palms Resort's main ballroom, cigar rolling, and (obviously) a dedicated buffet and bar. Toast the new year and don't forget to tip the complimentary coat check. Jamie Killin is a Phoenix-based writer. Follow her on Twitter @jamiekillin or on Instagram @jamiefayekillin.